Pumpkin pie and coffee, anyone? Thanksgiving is almost here, and I'm still trying to recuperate from a nasty stomach bug I had over the weekend.... meanwhile, Belle is in intensive care (otherwise known as the laundry room) with symptoms of being egg-bound, so I've spent the day nursing her back to health. She seems to be really enjoying the extra attention and the heat lamp however, and I'm beginning to wonder if I'm being suckered at a time when I could use a little down time myself. Oh, well... it wouldn't be the first time I've let that happen. It's hard to believe Christmas is just a little over a month away- I plan on putting up my decorations on Friday and Saturday. I'm a little funny about putting them up too soon; I like to celebrate and enjoy one Holiday at a time before making plans for the next one. Unfortunately, I didn't remember to put my Thanksgiving place mats out until this past weekend- I think they're so cute and they always make me smile. In the kitchen, I have a batch of venison jerky in the dehydrator... even though I know my stomach couldn't handle it right now, it's making the house smell so good I'm almost tempted to sample it. Since I may not post again until the weekend, I want to say how thankful I am for my home and health, family and faith, and friends... and how blessed I am to have so many online friends- each of you have made my day at one time or another, whether by your sweet comments, or by reading your wonderful blogs. You all have given me a smile on a lonely day, a tear to touch my heart, a laugh when I needed it the most, and for that I am so grateful. From my home to yours- Happy Thanksgiving! paula, I would LOVE a slice of your pie and coffee:) Wishing you and yours a very happy Thanksgiving full of many blessings!!!! Hi Paula, I hope that you and Belle feel better very soon. 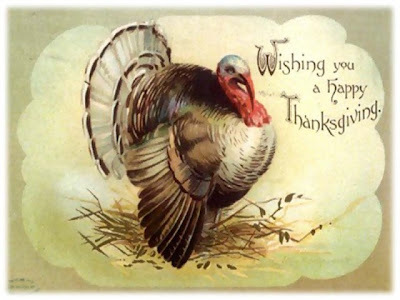 Happy Thanksgiving wishes to you all. I'm very thankful to have met you through blogging! Hope you all have a Happy Thanksgiving! And yes, let's get this holiday over before we start a new one! Hope you feel better soon...Belle, too! Hey, that rooster measuring spoon holder is a great classic. I hope you recover quickly from your stomach thing. Bad timing huh? I am the same way about decorations, each to their own seasons and no co-mingling! Ooooh, what an unpleasant, uncomfortable thought much less reality! That poor girl! Do you think they know what is happening to them? I know you know what is happening to you. Darn, girl! Not a good time for the flu bug. You take good care of yourself so you are feeling better soon. This is my first year to have Christmas up early. Since we are having no Thanksgiving here, and I got that nifty dry sink, I had to put some Christmas on it. Have a wonderful Thanksgiving, Hon. Give my love to James and keep yourselves warm! Still I'm wishing you and the family a speedy recovery so you all can enjoy the festivities of the season. Happy Thanksgiving, Paula. Ours was last month so I am slowly getting Christmas decor up.. Your pie looks delicious and I so wish I could stop by. So glad you stopped by. I am sorry to hear you aren't feeling your best. I hope you will still have a nice thanksgiving. So sorry you have been under the weather. And Belle, too. Take care of yourself and I pray you and your family have a wonderful Thanksgiving. YES! Do you even have to ask??? Today is pie m/baking day with toasted coconut chess and chocolate pecan chess pies on the menu. Maybe I'll make a pumpkin pie as well. Sambucol - order it from Amazon and use it to boost your immune system and prevent nasties. We swear by it at Thistle Cove Farm. Hope you feel better SOON sweetie!! Not sure what "egg bound" means but it sounds Painful! Hope SHE also feels better soon! I would like a cup of coffee and a piece of the yummy looking pie. I sure hope that Belle is doing better soon. Have a blessed Thanksgiving dear friend. Happy Thanksgiving to you and your hubby, Paula. I hope you feel better and can eat that pumpkin pie. Have a wonderful Thanksgiving, my friend! I'm glad you're on the mend and I hope you'll make a full recovery in time to enjoy all the yumminess you've prepared!! I hope that you're feeling better - I'm so sorry to read that you've not been feeling well. Belle is just too funny - she just wants some special time with Mama! I love your Thanksgiving placemats! Thay are just precious and so happy! I sure hope that you're able to enjoy that venison jerky really soon! I'm hoping that you'll be able to enjoy some Thanksgiving dinner, as well. Happy Thanksgiving to you Paula! That bug has hit our area too but knock on wood it hasn't been to our house. I hope you feel better real soon :). Just wondering about little Belle. Did everything come out okay so to speak? I hope you had a wonderful Thanksgiving. I love your little turkey placemats. Those chickens sure do know how to get reservations for an inside visit; don't they. How cute she looks, almost as if she's embarrassed as she seems to have her head buried innthe corner. I am thankful for you my dear...Everything looks so pretty at your place!That pie and jerkey look delicious too! I think i can smell it from here! Paula, your homemade pumpkin pie looks divine! Hope you guys all had a wonderful Thanksgiving! I can't believe that Christmas is only a month away either. I started my decorations yesterday, its becoming a 3 day, back aching event! I hope Belle gets to feeling better. Of course with all that pampering she may just be staying in Chateau de Paula! So sorry you've been sick. The stomach flu is just terrible. My kids would tell you that I'm paranoid about that one. I hope you're feeling better by now. Paula, I hope that you are feeling sunny again. I'm sorry that you were feeling under the weather.... yuck. I hope you are feeling better. Can you tell me what egg bound is? I am like you; let me get through one hoilday before I have to start another. Our decorations will be going up this weekend, hopefully. The chimney guy came to day and we can have a fire!! Yeah, so winter is here for me when I get to have a fire. I so love the smell and watching the flames dance. It's a perfect way to knit and eat shameful things that appear on my hips in the near year! Wahoo! I hope you are well by now, and Belle is too.If I were Belle I would fake a few more days too, intensive care at Fraker Farm appeals to me! Happy Thanksgiving belatedly, but really, Thanksgiving is a year round expression of the heart, so HAPPY and BLESSED THANKSGIVING! Hope you are fully recovered by now. Golly, I didn't know chickens could get egg bound! Belle is too funny. Love the pictures of the placemats, yummy pie and Belle. Hope you had a happy Thanksgiving. I hope you tummy is back to normal soon. I hope Belle is better soon too! How do you know when a chicken is egg bound? The chicken in the bed is soooo precious!